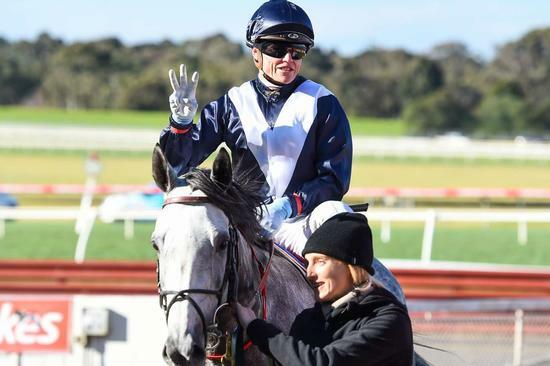 Craig Williams has taken a big step in his quest for a seventh Melbourne jockeys' premiership with a winning treble at Sandown. Williams started Wednesday's meeting two wins ahead of Damian Lane and victories on Ben Hercules, Legale and Villardo in consecutive races in the first half of the meeting shot the star jockey five wins clear. But Lane hit back in the final race with a win aboard Onslaught, reducing the gap to four wins with seven city meetings remaining before the season finishes at the end of July. "It's nice to peg one back," Lane said after Onslaught's win. "Willo has obviously had a good day today. I couldn't let him have all the fun. "Five wins was looking a big break at this time of year. Four might be a little bit more doable." Sydney trainer Matthew Smith made the right call to send German import Villardo south for Wednesday's Clanbrooke Racing Handicap over 2400m rather than wait for a race at Randwick on Saturday. Villardo, who drifted from $13 to start $26, notched his first Australian win at his fourth attempt, working home down the outside to defeat But It's True by a half-neck with another three-quarters of a length to odds-on favourite Hang Man. "Matthew Smith spoke to me and just said this horse was building nicely in his runs in Australia," Williams said. "He got outsprinted at the top of the hill and it was just a really nice staying performance. It will give him confidence." Williams' first win for the day came aboard two-year-old colt Ben Hercules ($2.10) who sat outside the lead in the Le Pine Funerals Handicap (1000m) and went on to defeat debutant Oceanity by a long neck. Williams rode Ben Hercules in his first two starts early this year and noticed a difference in the colt on Wednesday in his second start back after winning a maiden first-up at Bendigo. "He's definitely matured," Williams said. "He won with a little bit of authority today." Legale backed up his last-start maiden win at Ballarat with a one-length win over 1800m in benchmark-64 grade on Wednesday.